The year is ending here with a beautiful pink and yellow sunset, what a great way to finish off! As we all very well know, today is the last day of the year, it also happens to be me and my twin brother's birthday, we are turning thirteen. I have been interested in birds for over two years, and have been blogging since June 2013. Today I got a great birthday surprise. I was out walking the dog, and right in front of me was two Red Crossbills! My brother had seen some several weeks earlier, which tied him with me for most species this year. It is a lifer, and now that I saw it, I am leading by one species (if I remember correctly)! I have seen many many lifers this year, this year I started more seriously birding. I don't know exactly how many, I only really started using eBird this year. It has been a fantastic year and I have learned sooo much more about birds, with a lot of help from Christian Artuso. Thank you so much Christian for taking the time with us, we have learned a lot! And you have helped us see lot's of new birds! The Churchill trip was a huge highlight for the year, it gave me the opportunity to see lots of new plants and wildlife. Here are some of my favorite picutres from 2014. But there are so so so many more pictures I would have liked to add, it seems a shame to keep it down to this little (which is actually a lot). I might make another post later with more pictures. 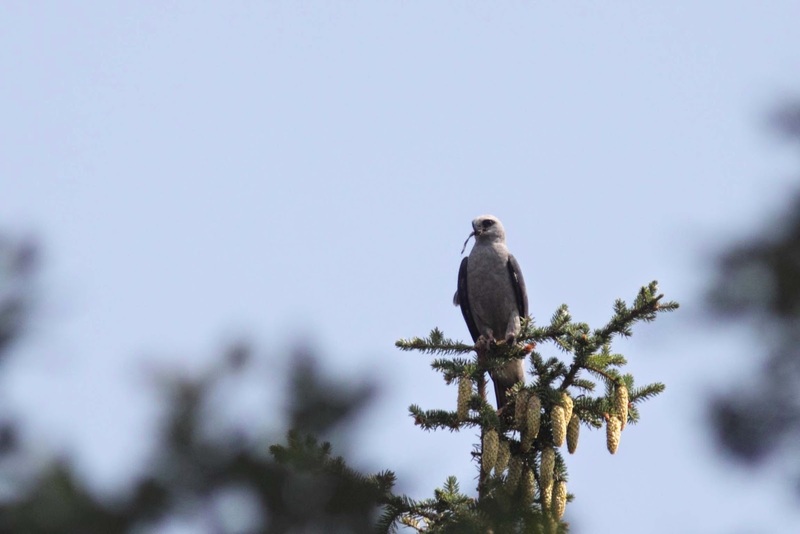 The Mississippi Kite was a big highlight for the year, a very very unusual bird for Winnipeg. There were so many fantastic pictures from Churchill, but I tried to keep it to only a few. Have a happy new year and Happy birding! Yes, it's been like five months since we went to Churchill, and finally I'm getting this post out. I've just forgotten or procrastinated or busy with school. So, at last I will post it. Churchill was such a fantastic experience, and all these pictures don't do complete justice, I wanted to add more, but I knew it would be too many. This day was for the whale and Fort Prince of Wales tour. We got onto the boat and went around on the river watching whales for a bit. We received word that four Polar Bears were seen at Eskimo Point. The boat driver asked us if we wanted to stop watching whales for a bit and see the bears. We agreed and were soon heading over there. We also saw some eiders flying along. UPDATE! : Christian Artusp told me that these aren't actually eiders, but Black Scoters! That's a new life and year bird (for last year). That brings my life list up to 199 sp.!!! One more species and I would have had 200! What a great way to end the year, now I can look forward to getting 200 species in the new year! My 2014 year list is now 193 sp.! Thanks Christian for pointing this out. We found all four bears, and apparently more were around Eskimo Point, but we couldn't find them. I got some really good shots of the bears, like this one, yawning. There was a mother and a cub, and two other Polar Bears on the shore. The mother and cubbed watched the the other two bears carefully. "Oh, I regret my life!" "Don't worry buddy, I'm here for you." This is another good picture, the bear looks cute. Here's a photo with all four of them. Then back to whale watching. Beluga Whales were very plentiful, and we had no trouble finding any, they brush passed the boat and swam around it. They lowered a device under the water that played the sounds from beneath the water on speakers on the boat, so we could here what the whales were 'saying', I thought that was very very cool. The squeaked and whistled in all sorts of fashions as they communicated with each other, extremely interesting. It was hard to get a good look at there heads, because they usually just barely surfaced on the water. A group of whales approaching the boat. I don't know what these whales do, but they seem very scarred. After a while we went to the fort, where we were toured through and given some of the history. Fort Prince of Wales has the only original canons left in North America, it's pretty interesting how the French disarmed the canons when they took over the fort, blowing off ends or something of the sort. It is actually pretty funny the history, the French came, dying of scurvy and totally unable to fight, but the English gave up the fort because the fort was totally not fit for defense, and they did not know the French were dying. There was only forty men there to defend the fort and to stop the canons from rolling of the wall, they had to tie them to the wall, which would have ripped the apart. A view of Eskimo Point, which used to be an island, but as the land is rising, is now connected with the mainland. We hopped on the boat again and headed back. Here's the splashes from the boat. The Churchill river... aaaaah.... The cool breeze was very nice. Eskimo Museum, a museum run by a friend of my parents, with all sorts of history. We looked around the nearby fields for a short time. I heard something and two birds flew over. I looked in my book and the calls I heard seemed to fit the description of a American Golden Plover's call. We went looking in the wet field, riddled with deep puddles and found where they had landed. It was a golden plover all right! We were able to approach quite closely and get some really good pictures. I got a flight shot when it took off. We took a last drive around Churchill before we got ready to leave. We saw a mirage on the bay a far way off. Very interesting. A lookout point across the river from the fort. There was also an exceptional amount of whales about, maybe a large school of fish. We also saw a kestrel on some wires. We loaded onto the train and left for Thompson. We got to see the derailment that happened a bit before which closed down the railway for some time. Lots and lots of grain was spilled there. Churchill was an incredible experience and I would love to go back any time!! It was a fantastic trip! I saw a great amount of birds, I was expecting over five lifers... I got twenty! It was extraordinary to see the great wildlife! It was also very special to my parents to go back to where they worked and meet old friends, and see the old and new study center.